Sir Theodore Gregory (1890-1970) could be said to epitomise LSE. A student and member of staff from 1910 to 1937, he was international in outlook; interested in theory, practice and history; a gifted teacher; and valued by governments and institutions across the world, writes Robert Bigg. Gregory was, appropriately, one of the inaugural Honorary Fellows of the School in 1958. Theodor Emanuel Gugenheim was born in Islington to German parents. He was educated in London, Stuttgart, and, following a short period with the London City & Midland Bank, went to study economics at LSE in 1910. In the archives are his student notes on currency and banking (most likely from lectures by Herbert Foxwell) with the very occasional charming doodle! He graduated with a first in 1913 and was immediately awarded the Hutchinson Research Studentship, working towards a DSc, at 100 Guineas a year (in real terms similar to today’s LSE PhD Studentships). This also involved giving some classes associated with Edwin Cannan’s economics lectures. At the outbreak of the war he anglicised his name to Gregory and enlisted. However, he was discharged from the Army in early December, after just 101 days, for being the son of an unnaturalised German subject. 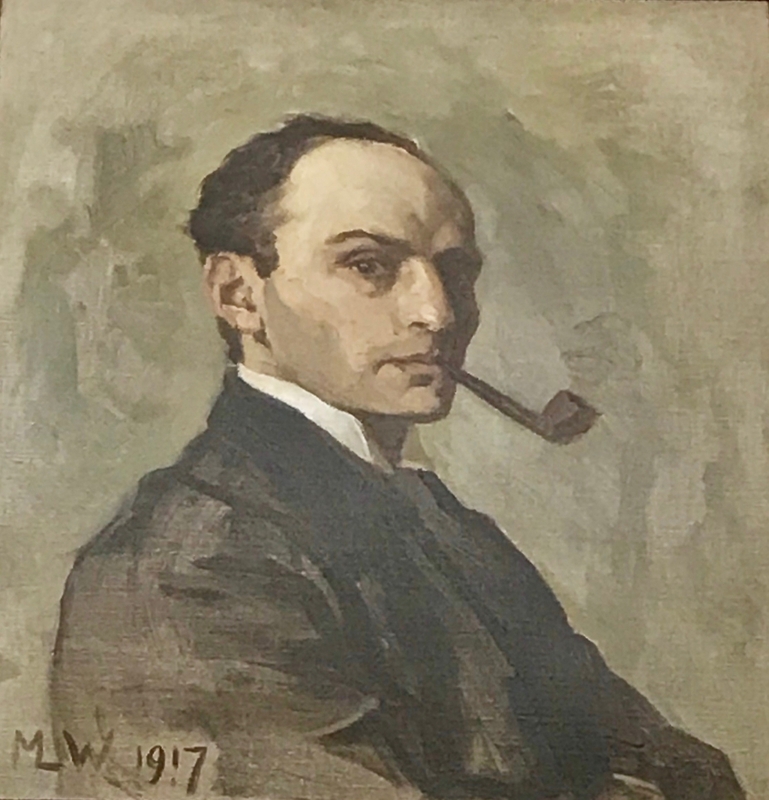 He was reinstated at LSE as an Assistant in January 1915, but in September he gave up the Studentship and combined giving some elementary classes on local government at LSE with the position of Acting Professor of Economics at University College, Nottingham (1915-1916). He started to lecture in Foreign Trade and became increasingly vital to LSE where other staff were being released for wartime service. The School lobbied hard for exemptions to his potential military service when, ironically, Gregory received call-up papers in 1916 and 1917. By then he was indispensable, “doing the work formerly carried out by three distinct lecturers” and in 1920 was appointed Cassel Reader in Commerce. The School started to press the University authorities to allow Gregory to submit for his much delayed DSc without first having completed the Master’s degree. As a result he was awarded a Doctorate of Science for Tariffs: a study in method (1921) and the Hutchinson Silver Medal for research excellence in 1922. “To know the causes of things” is apt for a protégé of Cannan. Gregory was known for wrestling with all aspects of a problem until he brought his audience to a lucid understanding of the issues involved. This made him an exceptional, though not necessarily an easy, teacher. Robbins’ Obituary (The Times 3 Feb 1971) points out that Gregory was “acutely conscious … of the disintegrating elements at large in the world”. His interwar books on currency reflect this, supporting a return to gold as less liable to inflationary abuse than a managed system. His analysis was meticulous, examining the problems of timing, parities, and the long-term supply and demand outlook for gold. He argued that exchange rate stability reflects the stability of relative prices between countries; thus the best way of achieving this was to link prices to the same standard; gold. He argued strongly against the inflation of paper money, and that experience had shown gold to be more stable than managed currencies. By the mid 1930s the argument was turning, the Gold Bloc was shrinking, whilst the importance of the Sterling Area grew, but still Gregory did not totally rule out a future beneficial move back towards gold if it were done on a sufficiently international scale. The LSE archive papers show that, by contrast, Cannan felt that the gold standard was irredeemably broken, like “Humpty Dumpty”, by the end of 1931. 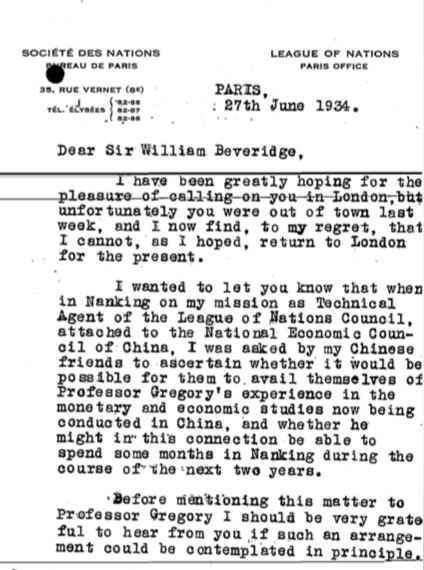 By the early 1920s his teaching focus at LSE had shifted to Banking and Currency. In 1926, a Sir Ernest Cassel Chair of Banking and Currency was established and Dr Gregory was promoted to it. His inaugural lecture (“The Social Function of the Banker” reported in The Times, 19 Jan 1927) includes a fierce critique of the domestic banking system, saying their balance sheets and statistics were a disgrace, especially in comparison to America and Germany. What he described as a stupid conservatism led to a lack of transparency, which, if ignored, could lead to a more radical reorganisation that could ultimately do more harm than good. He encouraged the banks to do more research into the economics of the business world. This promotion of, especially statistical, economic research recurred in his subsequent advisory work around the world. 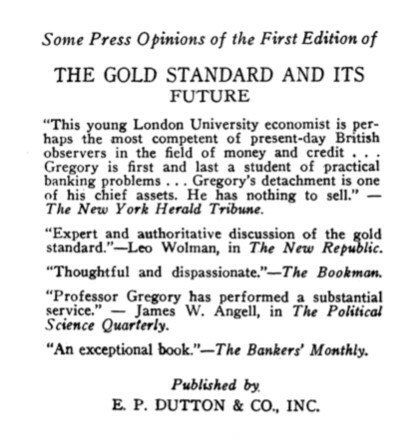 Gregory’s most significant work was concerned with monetary history culminating in his introduction to Tooke & Newmarch’s History of Prices (1928), Select Statutes (1929), and the Westminster Bank centenary history (1936). As the world sought to recover in the interwar period, Gregory sat on various official commissions including the Macmillan Committee on Industry and Finance (1929-1931, writing an addendum arguing for a policy of both increasing prices whilst reducing costs), advisor to the Niemeyer Missions to Australia & New Zealand (1930), and the Irish Free State Banking Commission (1934-37). Gregory held the chair until 1937 when he left LSE to become economic advisor to the Indian Government, for which he would be knighted in 1942. He was one of the inaugural Honorary Fellows of the School in 1958. Gregory, T.E.G. 1921. Tariffs: a study in method, London: C. Griffin & Co.
Gregory, T.E.G. 1921. Foreign exchange, before, during, and after the war, London, New York: Oxford University Press, H. Milford, 1921, 1925, & 1927. Gregory, T.E.G. 1928. 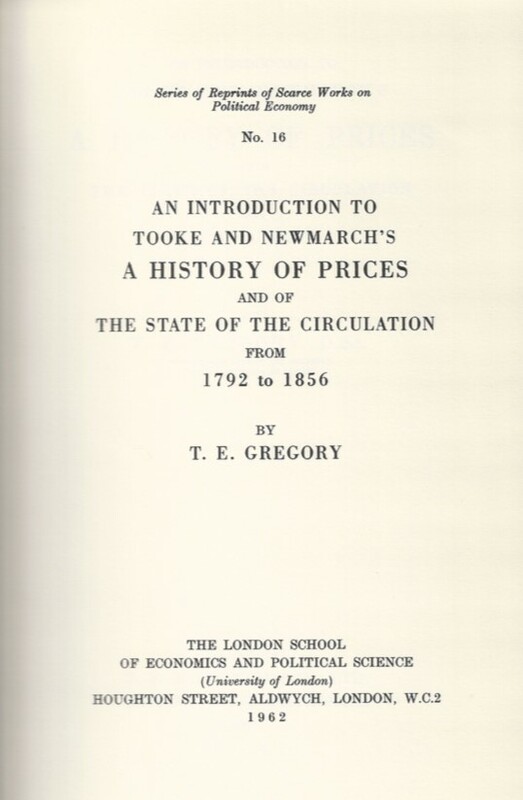 An introduction to Tooke and Newmarch’s A history of prices and of the state of the circulation from 1792 to 1856. London: PS King, Reprinted London School of Economics and Political Science, 1962. Gregory, T.E.G. 1929. Select statutes, documents & reports : relating to British banking, 1832-1928 selected with an introduction by T.E. Gregory. 2 vols, London: Oxford University Press, H. Milford. Gregory, T.E.G. 1932. The gold standard and its future, London: Methuen (New York: EP Dutton & Co., inc.) 3rd ed., rev. and enlarged 1934 (US – 1935).